I went to an exhibition last week at Suntory Museum and learned a new Japanese phrase that so completely captures the Japanese way of life. A phrase which increasingly resonates with me. (From Wikipedia): Mono no aware (もののあはれ), literally "the pathos of things," and also translated as "an empathy toward things," or "a sensitivity to ephemera," is a Japanese term for the awareness of impermanence (無常 mujō? ), or transience of things, and a gentle sadness (or wistfulness) at their passing. This phase was an epiphany to me... why the Japanese seemed so obsessed with taking pictures, celebrating micro-seasonal changes with festivals, making a spiritual "ceremony" of such a simple act of making tea. One aspect of this culture is so conscientious of honoring the present. For me, it has translated into a "mono awareness" of what it is to celebrate "living for today, and living today". It was such a treat to be invited by a Japanese set designer to a full dress rehearsal of a Manga turned musical performance earlier this month. While some of the singing lacked luster, it was a great first hand experience to see a live production of "The Black Butler". The stage set was quite impressive and the piece, set in Victorian England about the adventures of a demonic butler and his 14 year old young British Lord, with an entire Japanese cast was ... a tad surreal. The mascot of the Chiba prefecture is called Chiba-kun, and he is shaped like... the shape of Chiba prefecture! I rarely set scores by these mascot creatures but conceptually, he's pretty special. I was so fascinated when I first saw these, called Japanese Goya, a variety of gourd. It turns out they taste the same but have a different texture on the outside as the ones I grew up with in Singapore. I cooked them using a family recipe, in a stir-fry with eggs, rice vermicelli, minced garlic and they tasted exactly the way I remembered! The vegetable has to be sliced thinly as it has a bitterness to it. It is an acquired taste. Nezu is a rather unspoiled neighborhood in Tokyo. 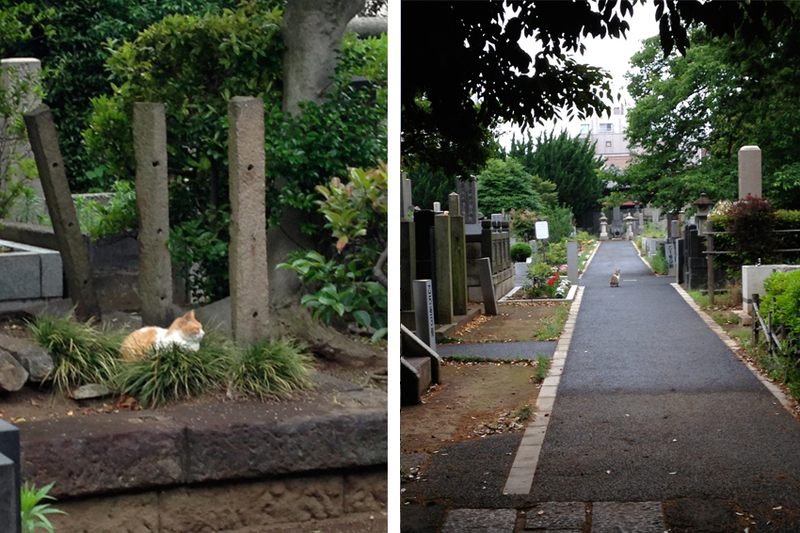 There are about seven thousand graves on the grounds of the Yanaka Cemetery. It was a cloudy day and its furry living inhabitants were out and about, taking in the cool weather. 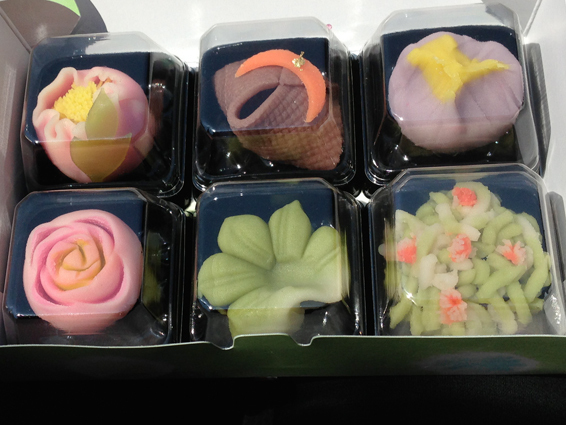 New Wagashi designs at my favorite shop Shiono in Akasaka. The first one is fashioned after the small individual Hydrangea flower unit; the season for "appreciating" Hydrangea is around the corner with the upcoming raining season. The second design is titled "The lost love letter". The design mimics a leaf with a single drop of dew. At the pond located on the grounds of the Yasukuni Shinto Shrine. 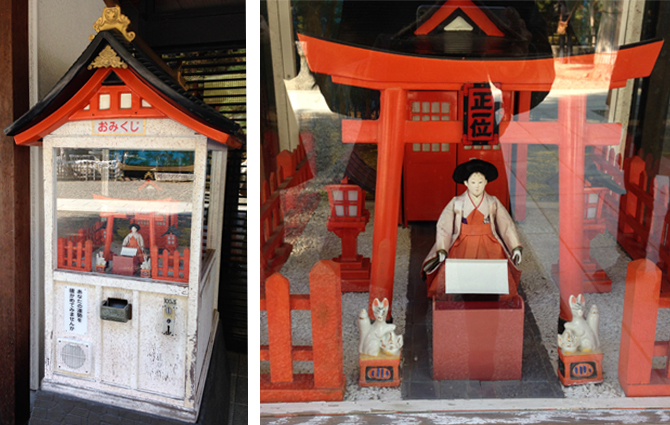 For 100 yen, a vending machine by a little hut overhanging the pond dispenses a cigarette size box of fish food pellets. The result is a cacophony of colors breaking the surface of the water in a feeding frenzy. "Nokogiri-yama", in Chiba, the "Saw Mountain". 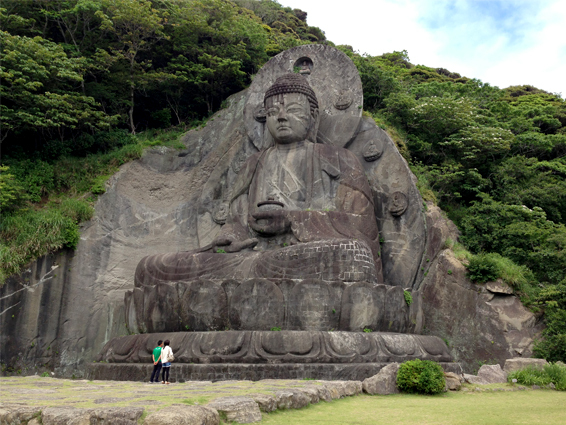 This hiking park is home to two immense Daibutsu or Buddha statues and a score of smaller ones set in various enclaves. 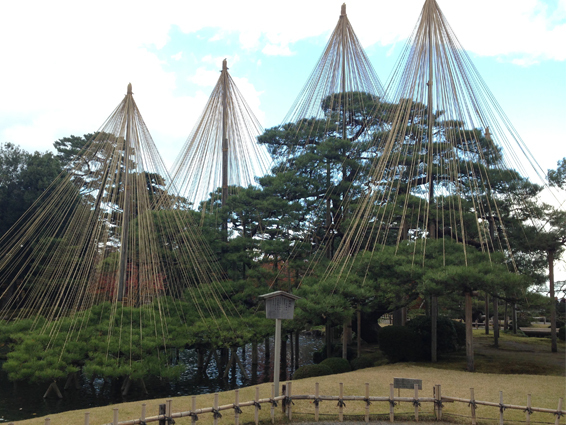 The Yajushi Nyorai stands at 101.9 ft, (31.05 meters). According to the literature handed out, the park is "the oldest Imperial invocation place of worship in the Kanto area". Ergo, the Emperor laid a pretty penny down to get it done. The second large Daibutsu is carved into the side of a stone hill with less dimensionality but no less poetry and beauty. It was pretty steep climbing up many flights of steps to get to the top of the mountain but the view of the surrounding mountains and sea was beautiful. The air was fresh and invigorating. The building where the Emperor would have taken his tea ceremony. I am constantly surprised that edifices associated with the Emperor are imbued with such incredible austerity. The roof is painted a subtle grey and the rest of the wood is left unadorned and unpainted. Taking a breather at a humble tea house (for the common people). Seasonal Wagashi served with a delicate bamboo pick, with Matcha (finely ground, high quality green tea that is used in tea ceremonies) and a sprig of green on an elegant lacquer tray. At Futtsu Beach, right at the "belly button" of the Chiba prefecture, (if you were looking at the overlay of the mascot shape). A structure of interconnecting viewing platforms right by the beach made for a distinct silhouette. It was a very windy day and the beach was covered in seaweed and lots of shells, with the occasional washed up jellyfish. 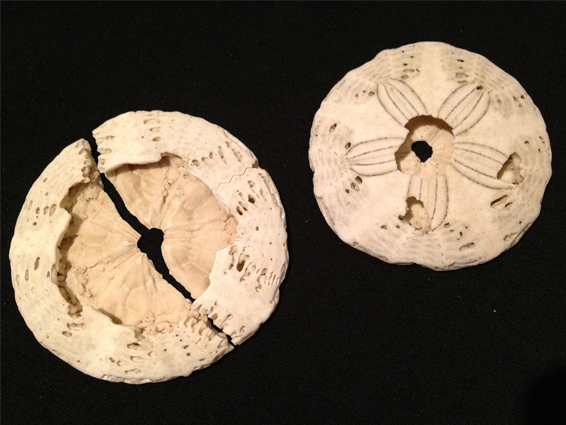 I found a rare fully intact sand dollar and what is more incredible, I found two halves of a second one, one half I picked up when I first started walking on the beach and the second half on the way back to the starting point. One of the most endearing and arresting sights at the San'en-zan Zōjō-ji (三縁山増上寺), a large and prominent Buddhist temple situated in a public park near the Tokyo Tower. Row upon row of colorfully "dressed" stone statues at the "Unborn Children Garden". Crimson and vermilion crochet caps adorn these foot tall statues. While I was filming this, the daily 5 p.m. chime came on, with the tune from Yuuyake Koyake 夕焼小焼け, a tune originally written by a school teacher. The words to the song remind the children that the day is done and it's time to go home. 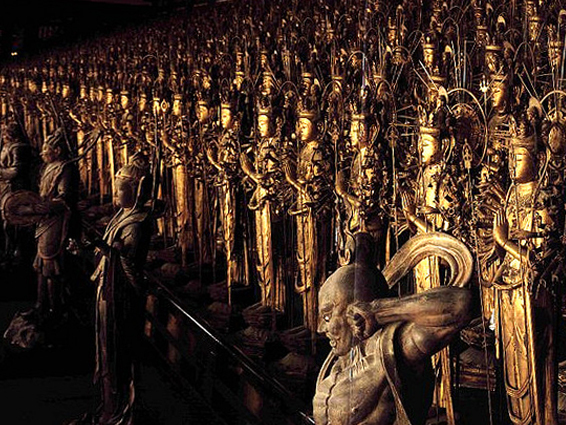 Kamakura is about an hour by train from Tokyo and offers a plethora of Shrines and Temples. 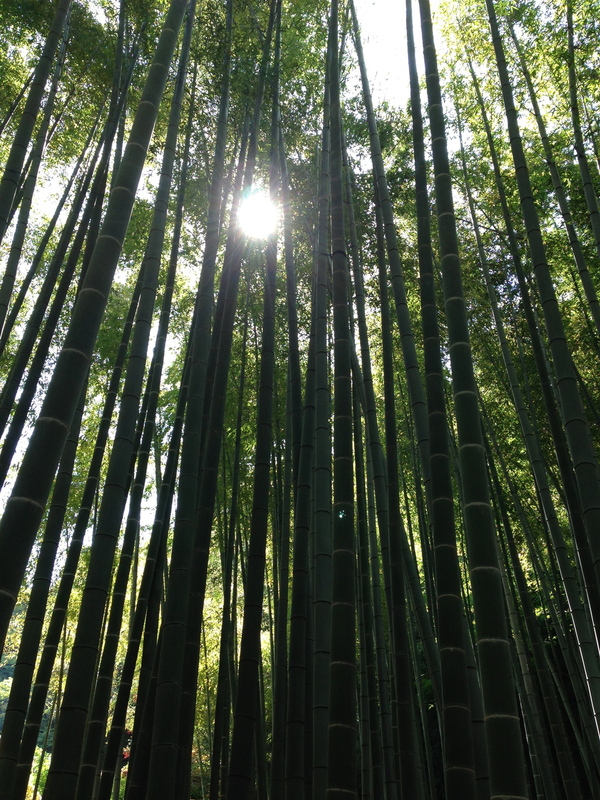 The bamboo grove at the Hokokuji Temple, albeit modest, still makes for a sublime walking experience. The local tramways were stuffed to the gills. The Japanese have a special way of impossibly cramming people into train cars. The Great Buddha at Kotoku-In (at the Hase station) was impressive. Guide books have reported that President Obama has graced this tourist site with his presence. Local Kamakura "octopus cracker". It's squid dipped in batter, put into a very high pressure "hot press" and cooked into a thin wafer like cracker. It looked like an abstract painting silkscreened onto an edible translucent substrate. The practice of dressing public sculptures and statues, large or small brings smiles out all around. 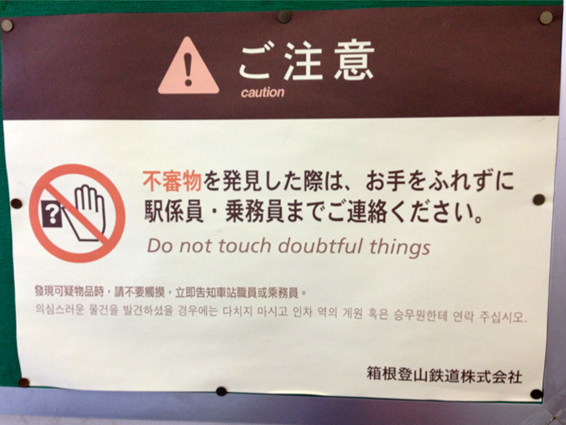 This, at the Hase train station at Kamakura. The setting sun on the way to Enoshima, a small island connected by a causeway with a walkway for pedestrians. 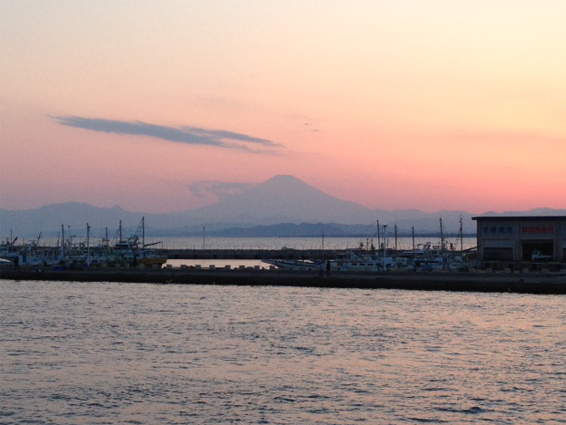 Mount Fuji (Fuji-san, as the mountain is affectionately known) in the distance bathed in a rose pink glow. On the left, strips of complimentary seaweed snacks at a newly discovered Udon and Soba restaurant, Honmura An Soba, in Roppongi (thanks to our friend Mark). The indigo color from the pickling of eggplant was intriguing, at Doma Doma, a local Izakaya chain. 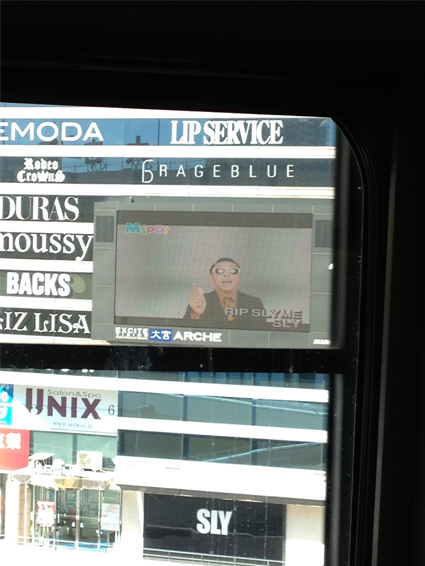 The "Romanc­ecar" Limited Express train runs from the Odakyu station at Shinjuku to Hakone. This train ride cuts the ride down to one and a half hours, shaving half an hour and the need to switch trains to get there. Hakone is located South West of Tokyo and makes for a lovely day trip. 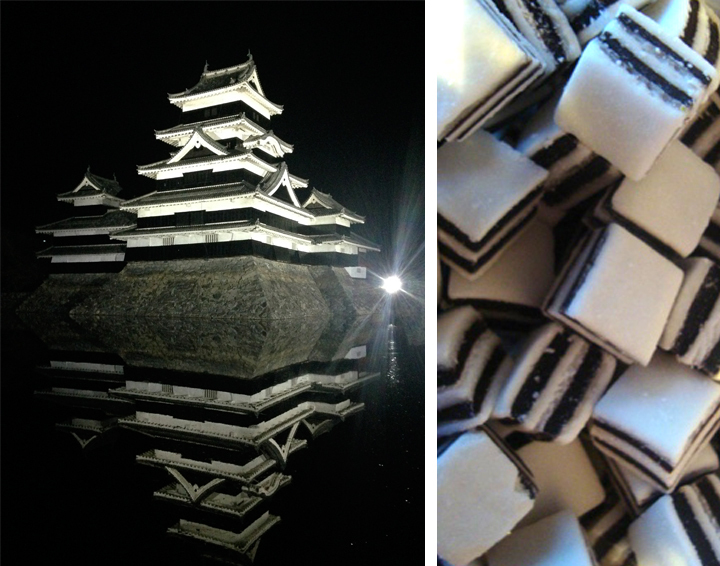 Upon arrival and foraging for food, I came across a little shop which sold... Wagashi! The reputation of the "pirate boats" on Lake Ashi precedes all other forms of transportation in Hakone. (There is a "ropeway cable car" and a track bound "cable car" in addition to vintage electric tram cars). An invasion of Disney in an otherwise unspoiled seaside town. My traveling companions were mobbed by Japanese school children who were clamoring to practice English and were kind enough to help the children complete their English homework assignment. I am the Eggman... Coo-Coo Ca-Choo.! 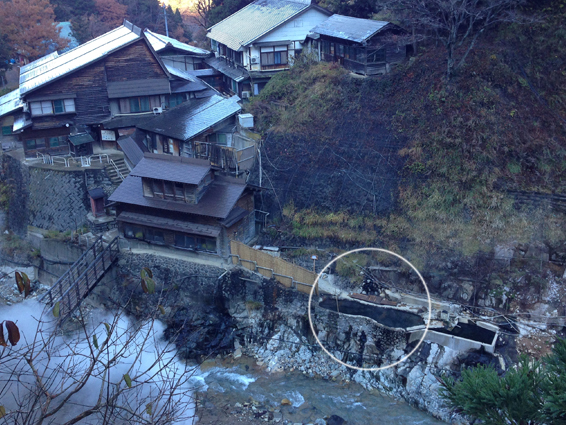 The sulphur springs at Owakudani is the first stop along the Hakone Ropeway (cable car). The hike up the hill was a gentle one but the air got pretty nasty near the pools of sulphur. This has to be one of the strangest tourist attractions. The infamous "not to be missed" food here — eggs that have been boiled in these steaming sulphur pools! This work man is collecting baskets of eggs that have just been boiled in the liquid sulphur vats. And the result? A completely blackened shell with a frosted sheen. The eggs were strangely beautiful and while there was a faint scent of sulphur on the egg white, they tasted like regular hard boiled eggs. I didn't think I could eat one on the spot, the fumes was positively vile! The last stop of the day was the Hakone Jinja Shrine by Lake Ashi. Surrounded by 800 year old cedar trees was a marvelous way to end the day. 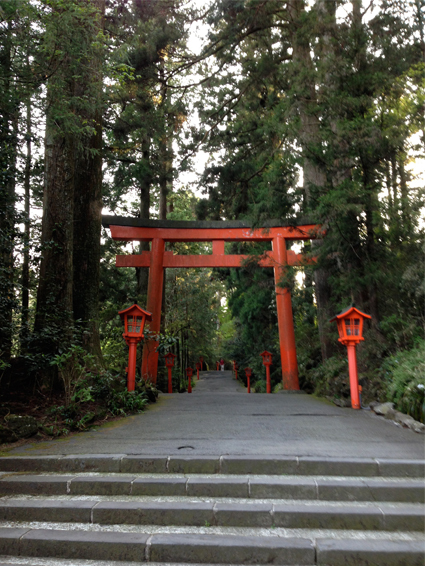 This is the Torii leading to the Shrine from the main road. Dragon statues at the shrine. Usually one is expected to rinse your hands with water (with ladles provided beside a trough of running water) before you go into the main shrine area. This was an additional special watering grotto located immediately outside the main shrine. 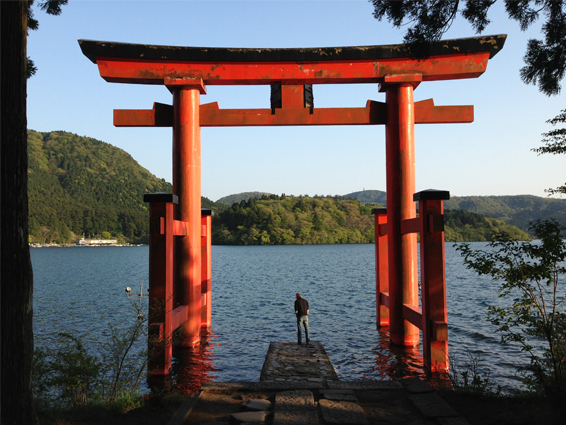 A stunning Torii in the water providing a gateway to the shrine from Lake Ashi.